Easiest Way - How to Send Care Packages to Veterans Overseas! 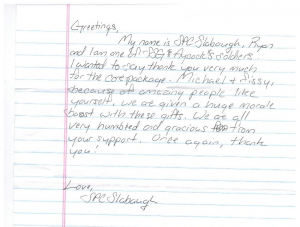 Sending gifts through the Operation Gratitude's Amazon Wish List is by far the easiest way to send gifts to veterans because they fill out the customs forms and do all the work for you! Operation Gratitude is a 501(c)(3) non-profit, and has shipped more than 1,600,000 care packages since 2003. Now, we have a super easy platform to use - Operation Gratitude's Wish List! Go to Operation Gratitude's Wish List in Amazon <The link opens in a new tab so you can refer back to these instructions. Click button that reads "Add to Shopping Cart" next to the items you want to send. Please come back every month. I will continually update this post so you can have the best information available, in case something drastically changes. I contacted Operation Gratitude and got a response right away from the CEO and Founder, Carolyn Blashek! Then I also got a great response back from the Vice President of Operations, Angel Cuevas!! "When using your Wish List, will the buyer's information be forwarded to you with the list that they bought... and will they get a donor's receipt from you?" Both were so super nice in their emails! 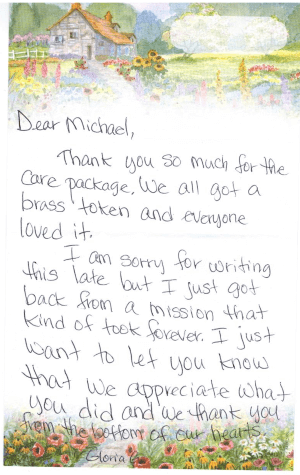 "it normally takes us 1-2 weeks to deliver a Thank You Letter (donation receipt) from the time that we receive the donation. So no need to email or call anyone. The process is simple, automatic, and pretty transparent"
Why would you need a donation receipt anyway? If you donated a substantial amount of goods, then you may be able to take that dollar amount off of your taxes at the end of the year. You should receive a donation receipt in the mail in a few weeks.